Figure 7.67 shows the connection diagram for Hopkinsons Test. One of the machines of the set is started as a motor (starter connections are not shown in the figure) and brought to speed. The two machines are paralleled by means of switch S after checking that similar polarities of the machine are connected across the switch. If this is the case, the voltage across the switch can be almost reduced to zero by adjustment of the field currents of the machines. Otherwise the polarities of either one of the armatures or one of the fields must be reversed and the set restarted. The switch S is closed after checking that voltage across it is negligible so that heavy circulating current will not flow in the local loop of armatures on closing the switch. The two machines are tested under loaded conditions so that stray-load losses are accounted for. 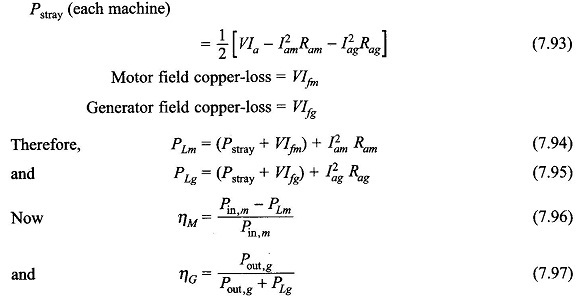 Since it is a regenerative test, the power drawn from the mains is only that needed to supply losses. The test is, therefore, economical for long duration test like a “heat run”. By merely adjusting the field currents of the two machines, the load can be easily changed and a load test conducted over the complete load range in a short time. Both machines are not loaded equally and this is crucial in smaller machines. Since a large variation of field currents is required for small machines, the full-load set speed is usually higher than the rated speed and the speed varies with load. The full load in small machines is not obtained by cutting out all the external resistance of the generator field. Sufficient reduction in the mo­tor field current is necessary to achieve full-load conditions resulting in speeds greater than the rated value. (iii) There is no way of separating the iron-losses of the two machines, which are different because of different excitations. Thus the test is better suited for large machines.